I’ve decided to take up a year-long project in which I take some time each week to mend or fix something. I have a number of reasons, the main one being that I have a lot of things right now that need relatively simple repairs that would make them more usable. I dislike throwing things away, and I need to curb my spending a bit, so making the things that I have last longer makes sense. 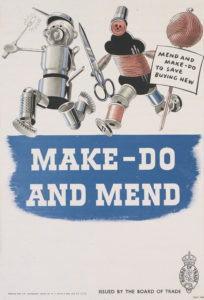 It will also be a way to develop some new skills and engage with some of the thoughts that I’ve been having about the unustainability of our consumer economy and the value and benefits (if any) of performing anachronistic manual tasks. Our current model for the creation and distribution of goods requires a massive input of resources and the exploitation of cheap labour often working in unsafe and unhealthy conditions. One of the easiest ways to decrease your environmental footprint is to just buy less things. The other reason is that I experience real difficulty in committig to long-term personal projects and I’d like to force myself to be more disciplined in following through with them. I allow busyness and paid work to push my own personal projects into the margins and the result is that I have a list of things that I want to accomplish with a perpetual deadline of someday. Without committing to regular deadlines that won’t change. I get tired sometimes of making things, at least, making things for the sake of making things. Do I really need more things in my life? Sometimes the answer is no. I have a list of things right now in my mending pile but not enough to last the whole year. One thing I’ve noticed though is that after committing to this project I’m starting to notice more and more things that aren’t quite right in some way that I’ve just subconsciously chosen to tolerate. So they’re getting added to the list. I’ll be tagging all the posts related to this project with #52mends so please follow along.